I have imported eclipse project from http://gotoandlearn.com/play.php?id=149 for create native extension. This project work perfectly but only Eclipse. Where is the problem? How do I set artifact? One more thing. If export jar file with Eclipse, that have jar 15KB and IntelliJ 1.5MB. IntelliJ IDEA doesn't have any special support for building ANEs.Using ANE in a Flash project is as easy as adding *.ane file to the Dependencies and listing extension id in the AIR app descriptor template. I didn't try, but I believe creation of ANE can be configured somehow as IntelliJ IDEA is very flexible in configuration and supports general purpose tools like ant or any external command line tool, etc. Yes I build ANE by command line, but together with jar file. 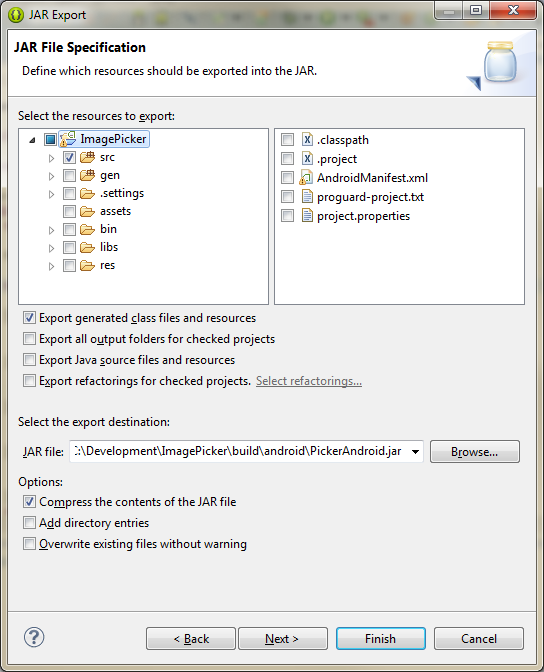 IntelliJ create jar correctly. Problem is with its use. Create ANE file involves much more steps and many module. It is a waste of that for this problem is not posisble using IntelliJ.